If you have a Cuisinart Chef's Classic cookware set and find yourself in need of a double boiler, great news -- you don't have to shell out big bucks for a bulky double boiler set just so you can make that perfect sauce. Instead, take a look at the Cuisinart Double Boiler insert pictured here. 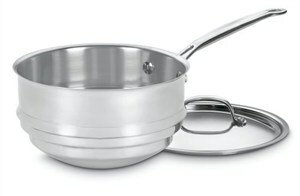 This double boiler has a rounded bottom which can fit into 2, 3, and 4-quart saucepans in the Chef's Classic product line. It's made from stainless steel and comes with a fitted lid topped with a large loop handle. The diameter is rimmed in such a way to discourage excess dripping when the contents are poured out. The double boiler is dishwasher-safe and oven-safe up to 550 degrees. As with other products in the Cuisinart Chef's Classic line, this double boiler holds up and performs very well. It heats evenly, cleans easily, and is fairly non-stick -- as long as the temperature stays at medium heat or lower. Peruse with caution if you don't have a matching Chef's Classic pot or pan. While this Cuisinart double boiler is labelled "universal," chances are it will only seal tightly on cookware bearing the same name, like this 7-piece cookware set.